I love going out to eat. I love not having to cook and especially love not having to wash the dishes. I have favorites everywhere we go, but one thing that I tend to order where ever available is spinach artichoke dip. 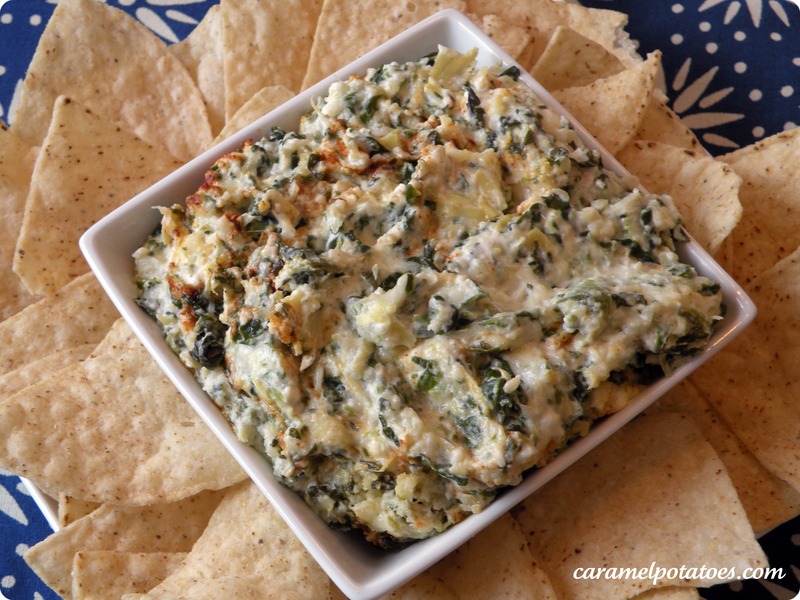 I love dips in general, but am a really big fan of spinach artichoke dip. I have tried many recipes out there to find one that I can make at home and really enjoy. Guess what….THIS IS IT!! It is so good. There is the perfect combination of and the necessary flavors-spinach, artichoke, and of course cheese. The mayo and sour cream are not at all overpowering. Next time you are having a get together don’t forget to bring this dip. But really, you don’t need a get together to try this. It tastes just as good with no one around at all (I would know). Preheat the oven to 350 degrees F. Spray a 8×8 baking dish. Combine the artichokes, spinach, Parmesan cheese, Monterey Jack cheese, cream cheese, sour cream, mayonnaise, and garlic in a bowl and mix well. Spoon the artichoke mixture into prepared baking dish. Sprinkle the top with paprika and additional cheeses on top. Bake for 30 minutes. Turn the oven to broil. Broil just a couple of minutes until the top is bubbly and golden. Serve warm with chips, crackers, bread or anything you like. Jocelyn, I am in love with your blog! And, I’m SOOO excited about this one since you got me so curious at the pool. Thanks so much!!!! Yum, this sounds sooo good! Can’t wait to make it for Football Sunday!